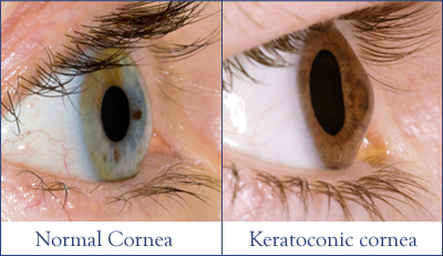 Keratoconus is an eye condition which affects the clear window at the front of the eye, the cornea. In keratoconus the cornea gradually thins, leading it to become irregular in shape. Compared to a regular spherical cornea in the normal eye, in keratoconus the cornea is more cone shaped in appearance. Individuals with keratoconus can have high degrees of astigmatism, often irregular in nature, and often require frequent changes in prescription. Diagnosis of keratoconus is based on assessment of symptoms and on ocular signs. The definitive diagnosis is given by mapping the cornea by topography imaging. Corneal topography is available on site at Collins Street Optometrists. Once a diagnosis is made your optometrist will discuss options for management. In initial stages spectacle lenses may offer good vision, but as the condition progresses most patients with keratoconus will be fitted with rigid gas permeable (RGP) contact lenses. Advances in RGP contact lenses have made comfort and vision significantly better for patients with keratoconus. If you have keratoconus that is shown to be progressive in nature, your optometrist may discuss a referral for corneal cross linking. Corneal Cross Linking is a specific treatment option undertaken by an specialised ophthalmologist. Collins Street Optometrists works closely together with local ophthalmologists to offer patients the best outcome should a referral be indicated. Keratoconus Australia is a non profit association offering a range of services and information for patients and their careers. For more information on keratoconus go to www.keratoconus.asn.au/questions.html.